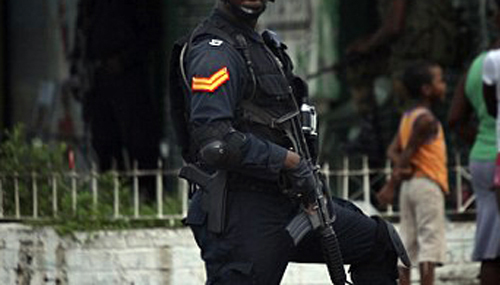 A man classified as one of the suspects in the quadruple murder of three brothers and a spouse of one of the brothers in Masemure Meadows, Little London Westmoreland last Thursday, was cut down in a blazing gun battle with the police on Monday in the volatile Grange Hill community. One Luger 9mm pistol with a magazine containing two 9mm rounds of ammunition was also seized. The deceased has been identified as 38-year-old Leon Smith, otherwise called ‘Rasta’, of Geneva district, Grange Hill in the parish. Reports are that the police went to a four-apartment building in Geneva to execute a warrant, and were greeted with gunfire. The law enforcement team reportedly took evasive action and returned the fire. After the shooting subsided, a man, later identified as Smith, was found suffering from gunshot wounds. The firearm and ammunition were taken from him. The Police say Smith was cited as a suspect in last Thursday’s killing of 31-year-old mechanic Howard Humes, 23-year-old Shavane Humes, 33-year-old Paulton Humes, otherwise called ‘Dwight’ and his girlfriend, Keneisha Wilson. The three brothers who lived beside each other, had their doors kicked open by a group of men who sprayed them with bullets.